- Turn left on Mayflower street and take the first left. - Go down two blocks and take Adams street to the right. -There is a drugstore and a bookstore on the left side. 1) Como posso dizer que a drugstore fica na esquina das ruas Madison e Adams street? 2) Estaria certo depois se eu dissesse? The library is on Madison Avenue. The Library is in front of the drugstore on Madison Avenue. lucasteixeira escreveu: Good Afternon everyone! Walk down Ave. Obama for two blocks. Then turn right on Adams St. Continue on till you reach Madison Ave. Then turn left. You will see the library on your right. 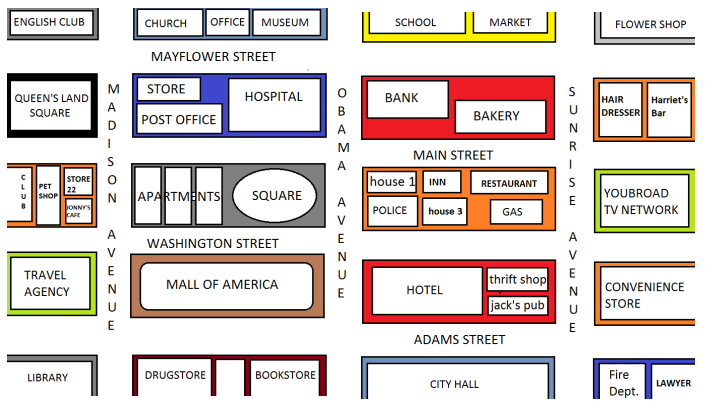 1) The (corner) drugstore is at the intersection of Madison St. And Adams St.
2) You will see the (corner) drugstore at the intersection of Madison St. And Adam St.
Fique com "The library is in front of the drugstore on Madison..."